Electronics360 says Micron has removed “128-Mbit 90nm serial and parallel NOR pin-out PCM devices from the products listed on its website". Sure enough we couldn’t find them there. Micron once supplied 45nm 1-Gbit PCM chips to Nokia for use in its mobile phones, and was the first to put PCM into mass production. This was Micron’s first generation PCM part. It announced a second gen 512Mbit part in December 2012. PCM, a type of non-volatile memory, relies on a characteristic of chalcogenide materials: their ability to change from a crystalline to an amorphous structure through the application of electrical current. The two resulting states have different resistance levels and these can be used to signal a binary digit value. PCM isn’t addressed in blocks and is faster than NAND. It is positioned as a potential post-NAND successor when flash process technology cannot be shrunk further, roughly beyond 15-10nm. But it seems that point has not yet been reached. But it seems that just 12 months after the blog was written, 3D NAND has saved it from a 180˚ turn towards PCM. 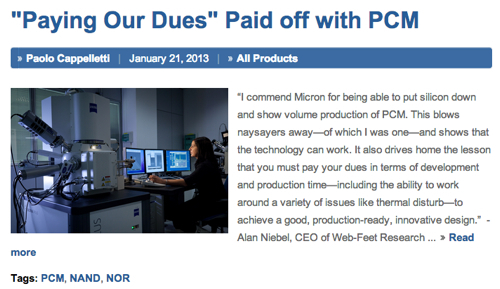 Although Micron now says it is working on a "follow-on process", no PCM products appear to be currently available for purchase. In an email to Electronics360, a Micron spokesperson said: "Micron's previous two generations of PCM process technologies are not available for new designs or technology evaluation, as the company is focused on developing a follow-on process to achieve lower cost per bit, lower power and higher performance." Micron's latest 3D NAND project, however, is seemingly ready for rollout. The technology aims to extend the life of 2D or planar NAND technology by placing multiple layers of it on a single chip, creating a 3D structure. It hopes to start production sampling of 3D NAND chips in the second quarter of this year, with general availability happening some time in 2015. This would increase the capacity of NAND chips, a significant reason why NAND process geometry shrinks have been pursued.